Monthly subscription boxes seem to be all the rage lately, and I sure didn't want to miss out! So, you can imagine how excited I was at the chance to review one of the originals, Citrus Lane. 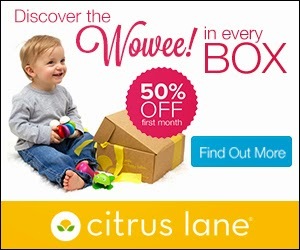 Citrus Lane is a monthly subscription box for your little ones from newborn to age five. They include all kinds of fun and great products for your little one and even for you too! The 4-5 products they include each month have been recommended and reviewed by their advisory board and community and you can rest assured there is no marketing gimmicks or no paid placements- just what they feel is the best products for you to try. 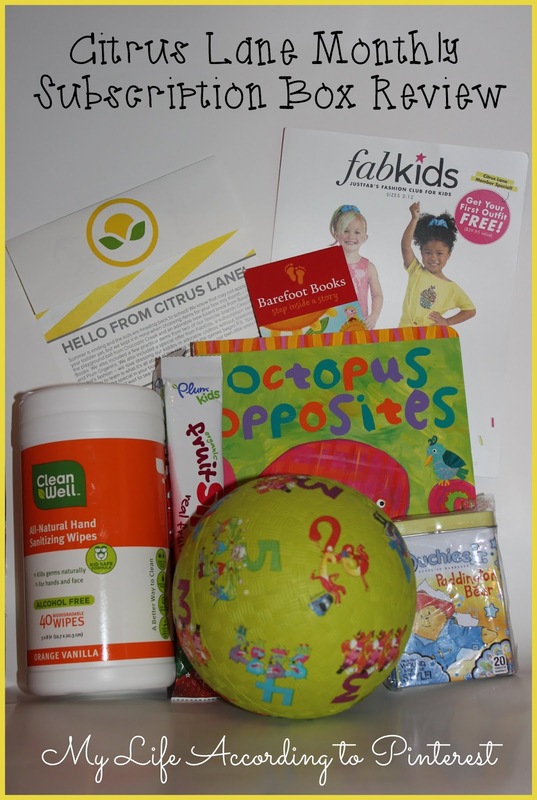 Citrus Lane only works with brands that offer the best products for kids. By doing so, Citrus Lane helps parents discover fresh brands and exciting new products. Some of our community’s favorite discoveries have been from top consumer brands such as Green Toys, Barefoot Books, Honest Company, Skip Hop, Plum Organics, and Aden & Anais. It's so easy to try: First, you choose your plan. They start as low as $21 a month! Then, you personalize your box for your child's gender and age. Then, you wait for your surprises to come in the mail each month! Each box is worth at least $25 in retail value, and shipping is always free. I recieved my signature box in the mail and I couldn't wait to open it up to see what was inside! Total Value: $28.50 or $68.50 if you take advantage of the free trial from FabKids! My son LOVES the ball! He's really get into playing with all types of balls and he didn't have a ball quite like this yet. He's been chasing it everywhere lately. I also love the Octopus Opposites book. We have a couple of Barefoot Books and we really enjoy them. The fruit straws weren't quite something I would feed to my son yet (he only has 4 teeth), but I tried them and they were tasty. I'm sure older children would enjoy them. Luckily, we haven't had to use our band-aids yet, but I'm sure they'll come in handy and the Paddington Bear character ones we received are so cute! And, I don't know about you, but I can never have enough sanitizing wipes handy. What's so great about these is that they are biodegradable and all natural. Citrus Lane even provided some fun do-it-yourself games for you to use with your child and one of their new toys. My box included some Do-It-Yourself Bowling Pins to use with your new ball. I love this little touch to incorporate crafts and play in each box. Follow & Connect: You can like Citrus Lane on Facebook or follow them on Twitter. Buy It: You can go to Citrus Lane's website to order a subscription for your child. Click here to get 50% your first box! i am a sucker for subscription boxes! i think my sister would really like this as she has a little one at home. looks llke a quality box.